Many years ago when I was first getting into the raw vegan lifestyle, I went to an extraordinary raw food festival in Oregon. It was in a beautiful outdoor setting, next to a lake, and very appropriate for nature loving raw food enthusiasts. Under the canopy of shade trees, I enjoyed listening to several top pioneers of the raw food movement speak on the benefits of raw nutrition. I also met a very impressive man who had recently won the non-supplemented Mr. Universe contest as a raw vegan – at the age of almost 50! He certainly was living proof that you can get enough protein on the raw vegetarian diet. But of all the amazing people I met that weekend, there is one who really sticks out in my mind. She was working at a booth selling raw organic coconut oil from Mexico. During one of the sessions, while most people were listening to the speakers, I paused at her booth to listen to her remarkable story about young coconuts. The story of this simple, humble and very alive woman touched me and motivated me to do some research on the nutritional properties of young coconuts. I had often enjoyed them but had no idea how great they were for my health. The water and flesh from young coconuts contains the full range of B vitamins, with the exception of B6 and B12. B vitamins are essential for providing us energy as they break carbohydrates and protein down. They also support nervous system function and, interestingly, the muscle tone of the stomach. Young coconut water is also high minerals, particularly calcium (for bones), magnesium (for the heart) and potassium (for muscles). An average young coconut provides 3 grams of dietary fiber which helps proper digestion and elimination. Fresh coconut water is very high in electrolytes – much higher than most sports drinks. This makes it a great choice for athletes and children who exercise a lot. Finally, the water of young coconuts is completely sterile and so close to the structure of human blood that it can be transfused directly. In fact, it was regularly used during WW II for wounded soldiers when blood plasma was low. Coconuts grow only in tropical climates. If you live in a tropical climate, they’ll be easy to find. Make sure to ask for young coconuts and not mature ones. Young coconuts are about 5 months old and have green hulls as pictured here. If you don’t live in a tropical climate you’ll probably be able to find coconuts in your local health food store. Usually they are from Thailand and are white in color –the green hulls have been removed for shipping. Don’t confuse young coconuts with mature ones – these have dark brown shells and very thick flesh. These are mostly used to make coconut oil. 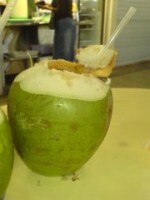 The water from these coconuts doesn’t taste good and has lost most of it’s nutritional potency. In India , coconuts are fertility symbols. When a woman wants to conceive, it’s common for her to go to a priest to receive a blessing with coconuts. In the Philippines it is said that humans originated from two coconuts washed up by the sea onto a rocky shore. Young coconut flesh is the first solid food for babies in Thailand, traditionally fed to them by a Buddhist priest. In traditional Balinese culture , women were forbidden to touch the coconut tree. Men feared that a woman’s touch may drain the fertility of the coconut tree into her own fertility. Natives of New Guinea believe that when the first man died on the island, a coconut tree sprouted from his head. This is an excellent advise and i am surely going to follow it and start having it. Can you tell me who is that woman who healed herself with young coconuts and how we can contact her? If she’s got a coconut farm in Mexico (we are there at the moment), we’d love to do visit her! I really like the coconut healing power story. My parents died of cancer. Not sure if coconut heals all types of cancer. I have a close friend suffer from lung cancer. I’ll certainly recommend him to give it a try. Great thanks for the post. of coconut milk and coconut flesh even more. Coconut juice has worked for me in digestion as a natural product but learning that it has to be treated like milk, only simmers in curry and never boil it as it curdles. Never keep stir it too much after simmering, it goes rancid very quickly in the hot weather. Chicken curry with coconut milk does not keep for too long. Best way to keep for dessicated coconut is freeze dried, the one on the shelf in supermarket are rancid as it can not be dried and sit on the shelf! Previous post: Natural Insomina Relief: A True Breakthrough?